Children in foster care often come to their new homes with only the clothes on their backs. Those who do have things to bring with them, usually have nothing to carry it in. The case workers have black plastic garbage bags and the children's items are stuffed into the bags. These darling children already feel pretty bad about themselves and the idea of having to use a garbage bag to carry all of their "worldly" items makes the child feel like "garbage", too. My goal is to provide many duffel bags to Department of Job and Family Services/Children and Youth Division so that maybe all children in foster care in our county have a special bag all their own! Wouldn't you like to help your county's children? There is a link at the bottom of the page that should help you find out how! Duffel bags ready to go to Children's Services! 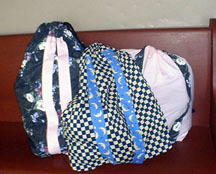 Step 1: Duffel Bags can be made of any scraps of fabric you might have. My general size is two piece of matching fabric, 22" x 25 to 36" for the body of the duffel and two pieces of matching or contrasting fabric 6" x 25" for the straps. You will also need piece of cord or a matching sewn cord approx. 45 to 50" for the drawstring. I use whatever size fabric scraps I have and adjust the bag accordingly. I make the bags in size according to the size of the child also. 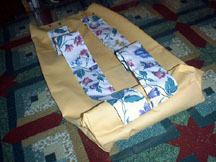 Step 2:Shown are straps for the bag. Press over 1/4" the entire way around each strap then , fold in the middle, meeting the edges together. Sew around the folded edges to fasten them together. I attach my straps to the top of the bag by placing them about 4" down from the top of the bag and about 8" apart. This allows the child to carry it on his/her back. 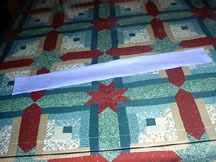 I sew in a square on the top of the strap and then sew an x acrossed the square to make the strap attached strong. To finish the bag turn under top 1/4" then under 1" . Sew around leaving a 1" opening for a drawstring. You can sew a drawstring from leftover fabric or use cording. Tie in a knot after threading though the casing to prevent it from being pulled out. I sometimes add pockets to the front for brushes, combs etc and add velcro to keep it closed. 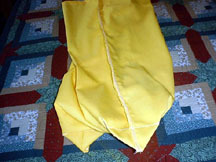 Step 5: Fold open the bottom and side seams flat to form a corner. 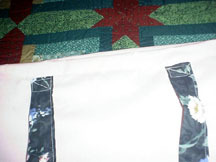 Sew a diagonal seam up about 3" from the point to form depth to the bottom of the bag. You need to do both sides. More pictures and direction of how to do this are on the purse style duffel bag page at this website. You can find information on those in foster care here!